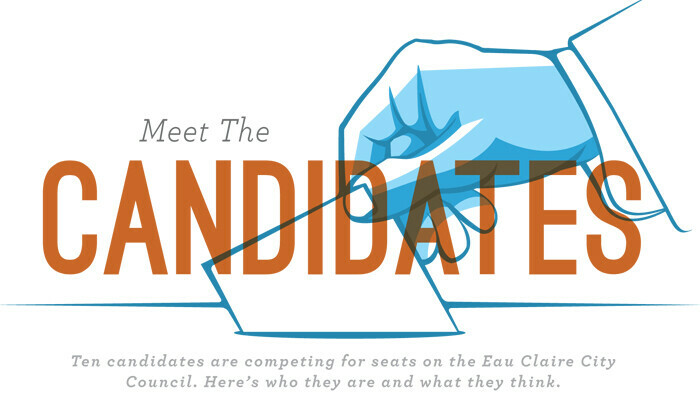 Ten candidates are competing for seats on the Eau Claire City Council. Here’s who they are and what they think. Autumn elections – the ones we use to pick presidents, senators, members of Congress, and the like – tend to get all the electoral love, along with almost all of the electoral money (and most of the electoral mudslinging). But during springtime there are critical elections as well. While races for local offices don’t get nearly as much attention, they are key for shaping our communities. In fact, the people who serve on city councils and school boards often make decisions that impact our lives more immediately and directly than the decisions made by presidents and senators. Likewise, as voters we’re much more likely to have an impact on local races than on national or statewide ones. On April 2, voters will fill five at-large seats on the Eau Claire City Council. Ten candidates are competing for three-year terms, and because these seats are at-large, all city voters can have their say. Two incumbents – Catherine Emmanuelle and Mark Olson – are on the ballot, while three others – Larry Balow, Jackie Pavelski, and Thomas Vue – opted not to seek another term. The brief biographies and responses below are provided to help you get to know the candidates. So get educated, then get to the polls! Continue reading for interviews with all ten city council candidates!